IN AN EMERGENCY, OUR SYSTEMS WON'T GET RATTLED. WILL YOU? The way people react in an emergency makes all the difference. 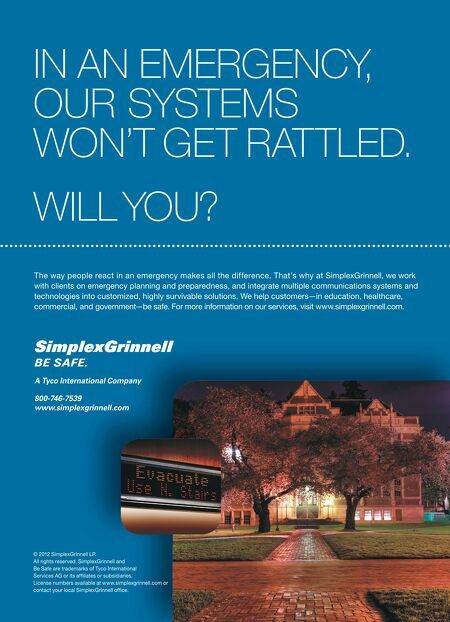 That's why at SimplexGrinnell, we work with clients on emergency planning and preparedness, and integrate multiple communications systems and technologies into customized, highly survivable solutions. We help customers—in education, healthcare, commercial, and government—be safe. For more information on our services, visit www.simplexgrinnell.com. A Tyco International Company 800-746-7539 www.simplexgrinnell.com © 2012 SimplexGrinnell LP. All rights reserved. SimplexGrinnell and Be Safe are trademarks of Tyco International Services AG or its affi liates or subsidiaries. License numbers available at www.simplexgrinnell.com or contact your local SimplexGrinnell offi ce.